I’ve had my eye on San Bruno Mountain since long before I was a ham. Having worked at San Francisco International Airport back in 2007-2009, I wondered what it would be like to hike to the top and watch the big planes take off (it’s 5 miles away). I also noted all of the big transmission towers on the top, and figured it was probably closed to public access. It took Summits on the Air to give me enough reason to actually go do it. Oddly enough, being new to working Parks on the Air, I didn’t realize until I was actually hiking up the mountain, that it was actually qualified for Parks on the Air. I had quickly planned this trip, carefully negotiating with family schedules and other obligations. I had originally intended to go back and get Mount Willson in Henry Coe State Park after having skipped it the previous weekend. 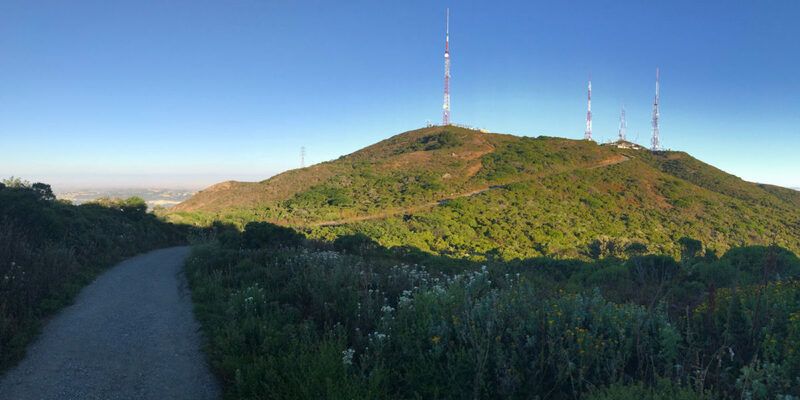 Once up on the fire road taking me up to the San Bruno Mountain Ridge Trail, I decided to post a photo on Instagram, and saw that one of the available location tags was “San Bruno Mountain State Park.” This made me realize it was probably qualified for WWFF/POTA. I had thought it was just county park (they’re not usually qualified for POTA). While continuing to hike, I quickly checked the list of parks and found out San Bruno Mountain State Park is qualified. And on some maps, it’s called “San Bruno Mountain State and County Park.” Excellent. So this would be a SOTA and POTA activation. Since I have a backpacking trip coming up, instead of taking the easier, shorter way up, or doing this as a trail run, I decided I’d load my big backpack up with around 42lbs (19kg) and get my body a little bit ready for it. I loaded it up with tent, sleeping bag, water, weights, jacket, and all my radio gear (amongst other nonsense to get it up to weight). I hit the road around 0515, getting a nice early start so I could see the sun rise, enjoy the cool air, and get back in time for later obligations. My goal was to get on the trail around 0600, and I managed to do so. I scoped out the trailhead area using Google Street View prior to arriving. I saw a parking lot for a school, which would likely be empty on weekends (especially during summer). When I got to the parking lot, I saw threatening signs saying it was “staff parking only” and “you will be towed,” etc. These signs didn’t much concern me but I discovered a baseball field further back, with no threatening signs in its parking lot, so I parked there. I’m guessing nearby streets would also be worthy parking locations. I checked for a toilet/bathroom. There was one, but it was locked. Anticipating this, I had made a pit stop on the way up from San Jose. My backpack was all ready to go, so I threw it on and got to walking. After looking around a bit, I figured the easiest way to the fire road was to go back out to the street (Hillside Blvd) and walk 10 yards or so to a gate. Over the barrier next to the gate and I was on my way. The fire road starts out climbing, pretty gently at first. But you start getting some views of the surrounding area right away. About half-way up, it levels off a bit. A little break before another rigorous climb to the Ridge Trail that runs along the summit ridge. This is a nice place to collect your thoughts, such as “why am I doing this the hard way?!”. Oh yeah, it gets steep again! This route is pretty simple. Up, up, up. Then left. Reaching the Ridge Trail is quite obvious. Take a left at the junction and the Ridge Trail is just that: a trail running up and down along the gentle ridge. A little bit of hiking on the Ridge Trail and you start to get the amazing views. You can see most of the Bay Area on a clear day. In this case, there was a layer of fog below, but I could still make out some landmarks. It isn’t long before the destination is clearly in sight. It was somewhere around here that I had the first of two unexpected delays on this trip. I have a supposedly non-life-threatening heart condition that occasionally causes half of my heart to beat uncontrollably fast. It’ll come on suddenly, and stop just as suddenly. Sometimes it lasts a few seconds, sometimes several minutes. In this case, it lasted several minutes. It’s quite unpleasant, and always causes me to stop whatever I’m doing. I’ve had numerous visits with cardiologists and their test equipment, all to no avail—we’ve never even managed to capture it on any of the machines. Sneaky little bugger. At least I had nice views to try to enjoy while suffering through it. Once my heart decided to chill out, I resumed my trip to the summit. Approaching the summit, there’s a trail junction (I somehow forgot to take a picture). It’s the “Summit Loop” trail. I just continued straight up to the gate to “Radio Road,” with a parking area at the top of the mountain. After looking around the summit a little bit, and determining the true summit was too close to, and on the wrong side of one of the big antenna towers, I landed on a little mini-ridge right near the parking area. A short little walk up this and I’d be out of the way of anyone passing through, and able to set up my end-fed antenna pointed roughly east in an inverted-L (or maybe V) configuration. I determined I could wedge my 7m squid pole into the rocks, run the wire up to the top of that, then down to the shoulder of the road. Basically, something between an inverted-V and inverted-L configuration. It took me a while to work this out. Every summit is different, and I’m still getting familiar with the ways I can use my end-fed antenna (lots!). Getting on 20 meters, I found the noise level to be too high to do anything—the meter was indicating S7-S9 noise. I tuned around a bit anyway, to see if I could hear any strong stations. Nope! Even on 14.300MHz, where there are normally at least one or two strong stations, I could barely hear them down in the noise. So I switched over to 40 meters and worked to find a clear frequency. Between 7.200 and 7.300MHz was dominated by overseas broadcast stations as usual. I’m never quite sure how much space is enough between those stations, so I usually try to find something below 7.200MHz. Being an Extra class, there are a lot of frequencies on which I could operate, but I stay in the General class area so that everyone operating HF has a chance to contact me. I ended up finding a quiet frequency, and checked repeatedly to see if it was in use. Then I started calling CQ while spotting myself with the SOTA Goat app. I put a note in my SOTA spot saying I was also doing POTA KFF-1196. Then the contacts started rolling in. Sometimes I get tunnel vision on getting set up and operating and forget things, like the fact that I have more than one radio. I had a QSO with WA6OEM on 40 meters, after about 15 minutes of operating. He was coming in 20dB over S9 on the meter, practically overwhelming my receiver. He mentioned he was over in Alameda, just across the bay. That made me realize I hadn’t pulled out my HT and turned it on! So I did so, and asked him if he could try calling me on 146.52. He did so, and I heard not a peep. I also made a call for anyone else and heard nothing. I concluded the poor little HT’s receiver was likely completely overwhelmed by all of the RF likely floating around the top of this mountain, with its 10 towers and countless antennas. Fortunately, 40 meters was still working, with contacts coming in from near and far. After getting up to 12 Q’s, I decided to pack it up. Just as I was doing so, I encountered the second unexpected delay. While I was packing things up, I saw the park ranger drive by, thinking nothing of it. She talked with some cyclists that had ridden up the road. Then she got back in her vehicle, drove in my direction, and stopped right where I was set up. She got out, said hi, and started questioning what I was doing. I explained that it was ham radio. To my surprise, she replied with “oh! my dad is a ham.” I figured, “great!” She continued on in a bit of a questioning nature, almost as if there was something wrong with what I was doing, so I decided to drop what I was doing and really chat with her—let her know I was making contacts with far-off places, tell her about Summits on the Air, Parks on the Air, etc. She got a lot friendlier as we conversed. Finally, I asked directly if she thought there was something wrong with what I was doing, or where I was (not on a trail). She said she didn’t honestly know about the radio operation, but that she was now curious. Good enough for me! She asked my name and call sign, and gave me her name, and her dad’s call sign. She’s Lisa, but I can’t remember her dad’s call sign — it was a 2×2 starting with “W.” We talked about her job for a bit—generally pleasant conversation. Anyway, I’d say it went fairly well, and I hopefully left her with a positive impression of ham radio and SOTA/POTA. She seemed quite interested. I think it was worth having another delay to take the time and talk about what I was doing, rather than hurriedly packing up and giving terse answers (which is what I wanted to do!). Who knows—maybe we’ll have another ham in the near future! After packing up, I got a 360 photo and got on my way. The trip down was considerably faster, though the steeper sections did require careful footing. Overall, a fun and straightforward activation!